A modern-day Jessie Tuggle [NFL All-time Tackles leader] for the Pilots defense, behind the leadership of the 6’0, 202-pound 11th grader, Cardinal Spellman successfully pitched their third shutout of the season on Saturday afternoon, defeating the Bawkhawks of St. Dominic’s by a score of 21-0. The victory completes the early season sweep of their Long Island foe and raises the Bronx based program’s overall record to 3-2 (3-1 in league play). In eight quarters of play between the two schools, Spellman did not allow a single point to St. Dom’s. Living in the offensive backfield during the fifth week of the regular season, Ortiz’s ability to consistently “beat the opposing running back to the point of attack” made him a nightmare from which the Bayhawks would never awake…Of his career-high 20 total stops (10 solo), more than a few would yield a loss of yardage, forcing their opponents from Oyster Bay to constantly be buried behind the proverbial 8-ball. Increasing his 2018 total to 70 tackles (a mind-blowing average of 14/game), Ortiz is currently the clubhouse leader in the category among all Division “A” student-athletes, and ranks 2nd in the NYCHSFL regardless of classification [behind only Chaminade’s Phillip Arnold, who has 71]…An individual who never seems to take a week off, Ortiz has now reached double digit stops in all five of his appearances this season, commencing with a 14 tackle effort in the season-opening win over Nazareth and never slowing down since. And while his defensive skill set may be his trademark, let it be known that this young man is equally as tenacious when it is his team that has possession of the pigskin…Molded in the image of former 14-year NFL veteran, Lorenzo Neal, when lining up at FB, Ortiz is a lethal lead blocker, as evident by the 200+ yards his teammates were able to accumulate on the ground last Saturday…With Ortiz paving the way, the Pilots are running for an average of just south of 170 yards (169.2) per game. From the same oxymoronic standpoint that causes us to laugh when tall men are named “Short”, or when we nickname our chubby friend, “Slim”, the fact that this 6’0, 215-pound gifted specimen has the last name Lacks is proof that God has a darn good sense of humor…We say that, because if anyone has watched what the Maverick 11th grader has been able to accomplish during the first 2.5 years of his scholastic career, you know all too well that there is not a single tool that this prodigy is lacking. A combination of breakaway speed and chiseled muscle, it was neither coincidence, nor luck that the New Jersey native was invited to the US Army All-American combine last December, signifying him as one of the top-600 class of 2020 student-athletes in the nation. By far the most statistically dominant runner in all of the NYCHSFL this season, even before the 18 carry, 235 yards, three touchdown performance he put forth during Moore Catholic’s 42-12 triumph over Mount St. Michael’s Academy this past Saturday, Lacks already stood atop the leaderboard in every major rushing category. The only difference is now he has separated himself from the rest of his peers and established a class all his own. Well on his way towards a third consecutive 1,000+ yard season, at the midway point of his junior campaign, Lacks has gained 883 yards on 116 carries (7.6 average) and is currently tied for 3rd in NYS (despite playing one fewer game than the gentlemen above him) with 13 touchdowns on the ground…In terms of his decorated career, his TD treks of 70, 60, and 9 yards in the win over the Mountaineers a week ago give him 13 multi-touchdown games (including all five this season)…His 235 yards on October 6th was a career-high and now gives him three 200+ yard games in his career (including two in 2018; also ran for 221 yards and tied his career-best of four TDs in a week #2 win over Holy Cross). A special talent that could effortlessly be a POTW candidate every time his team picked up a “w”, Lacks returns to the list for the first time since week #8 of his freshman season….However, with his team remaining unblemished (5-0) and moving ever closer toward their second championship weekend in the past three years, there is no doubt that the only individual honor he has on his mind is another [was the 2016 “A” recipient] the title game Offensive MVP trophy. 48 minutes? Who needs 48 minutes? Based on what he has accomplished the past two weekends, the 6’1, 175-pounder out of Bellmore certainly does not need them…Nope, there is no punching a time clock for this junior Firebird; he is quite content doing three times the damage of his mortal counterparts in half the time. A week removed from exploding for three first half touchdowns and 144 total yards (91 rushing on 11 carries; 3 receptions for 53 yards) in a 34-11 victory over St. John the Baptist, the Marianist phenom tailback would be even more otherworldly this past Saturday, running for a career-high 186 yards and another three TDs on 14 carries (13.3 average) in a 41-3 drubbing over Holy Cross. Getting off to a boiling hot start for the second weekend in a row, Delucia would double Kellenberg’s 1st quarter lead to 14-0 [following a Jake Deakin TD earlier) when he shook off one tackle and then cruised untouched the rest of the way down the near sideline for a 57-yard touchdown…Approximately six minutes later (10:05 remaining in the 2nd quarter), he would bust free again, this time from 47-yards out, starting his trip along the opposite sideline but then cutting back toward the inside to record his second TD of the half [5th 1st half TD in the past two weeks) to make the score 21-0. 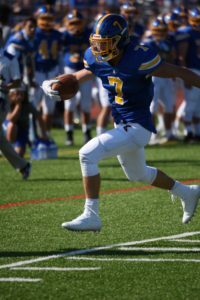 Spending much of the final 24 minutes being rested while other teammates got their names in the paper, Delucia would turn on the jets one final time late in the 3rd quarter, when he took the triple-option hand-off straight up the middle and ran 17 yards undeterred to close out the scoring for KMHS (41-3). As a result of his aforementioned career-best rushing day, through five weeks of the regular season, Delucia ranks 1st on the team in every running category. And, despite having to share carries, his 420 yards (on 51 carries) ranks 7th overall in Double-A and his eight touchdown runs puts him in a four-way tie for 2nd among all NYCHSFL players regardless of classification. 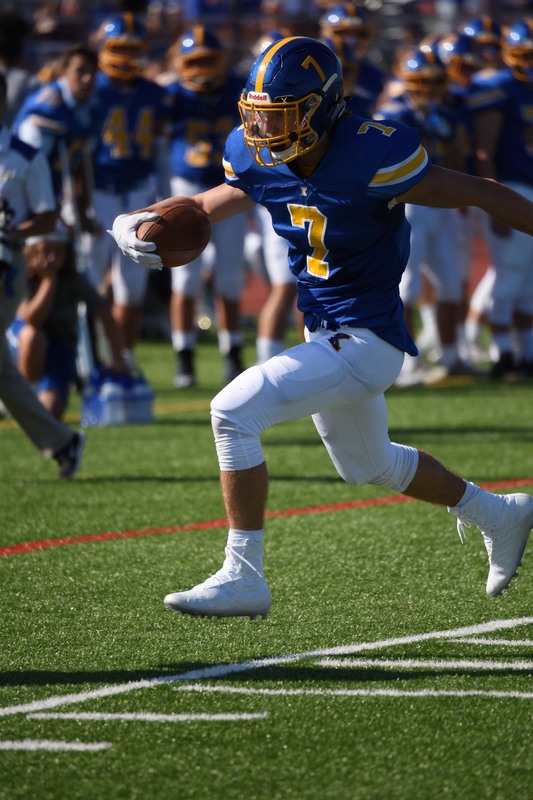 Winners now of 16 contests in a row, Coach Kevin Hanifan’s cohort may face the biggest challengers to their streak this coming Sunday when they are pitted against their brother school, Chaminade, in the 2018 Marianist Bowl….Picking up their most recent victory in this series back in 2010 (0-5 since), should Kellenberg hope to prevail over their brethren, they will need to receive another huge contribution from DeLucia…The host Flyers (2-3) are surrendering an average of 255.8 yards and two touchdowns per game on the ground. Therefore, Delucia and the rest of the stacked Firebird offensive backfield have every reason to feel confident that there will be ample openings from which to exploit in their bid to stay unscathed. Way back during the first week of the season, we wrote in the preview that in order for the Rams to enjoy another winning season, they would need to incorporate a more balanced approach to their offensive attack. One of the names that we tossed out at that time as a potential breakout star was the 5’11, 170-pound junior who had previously been utilized more consistently as a defensive back…Now five weeks into the future and we could not be any happier or prouder to announce that the New Rochelle resident is well on his way towards reinventing the offensive scheme as more of a traditional 50/50 system where opposing defenses are left guessing on every snap. Boosting a 100-yard rusher just seven times in the 44 games (16%) during the four-year reign of Matt Valecce as king/leader of the offense, since assuming the starting tailback role, Wallace has already posted three century mark performances, including a 12-carry, 145-yard effort last weekend in propelling Fordham Prep to their fourth consecutive victory, 31-13, over St. Francis Prep. An honor roll student while enrolled in Advanced placement courses, Wallace extended his streak of consecutive multi-TD games to three in a row on October 6th, but did so without recording a single rushing score…On the contrary, he would showcase the other facets of his game, acting as both a kick returner and a receiver out of the backfield in securing the “w” over the visiting Terriers. Seeing his team fall behind 7-0 in the first quarter, Wallace wasted no time in issuing a response, taking the ensuing kickoff 82 yards to the house to tie the game at 7 apiece. With the Rams now leading 17-13 in what had been a very back-and-forth contest for the first 36 minutes of play, Wallace would make the most of his lone reception, catching the Derek Bufano pass and then racing 55-yards for the first of Fordham’s two 4th quarter touchdowns to create that much cherished cushion…Of his six catches this season (totaling 170 yards), half have put “6” on the board. 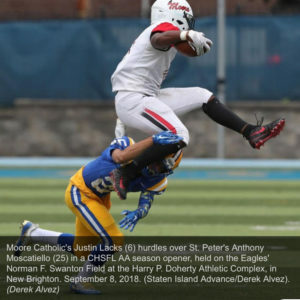 Ranked 3rd in Double-A and 5th overall in the NYCHSFL with 544 rushing yards (59 carries; w/4 TDs), Wallace will again need to be at his best during week #6, as October 13th will feature a confrontation of titans when Lacks-led Moore Catholic travels to the Bronx to square off with Fordham Prep in a pivotal AA Western Conference donnybrook. As the saying goes, you cannot keep a bunch of good men down…In the case of the 2018 Cardinals, despite starting the season 0-2 in league play, there was always an unspoken confidence that It was a matter of when, not if, they would find their true selves….And that moment would come during the fifth week of the regular season when they posted a 24-18 victory over Christ the King. A program that over the course of the past three seasons had become notorious for its unmatched aerial attack because of the presence of All-State signal callers Christian Anderson and current field general, Sofian Massoud, October 6th would be uncharacteristically be all about the ground attack for Head Coach, C.J. O’Neil’s flock of Cardinals. Feeding their 5’11, 170-pound senior tailback [Brown] 27 times last weekend, the Bronx resident would run for 183 yards and score twice in single-handedly recording half of Hayes’s point total on the evening…The quantity of running opportunities, coupled with the yardage accumulated on the ground would signify something of a turn back the clock night for Cardinal Hayes. Not since they boosted the likes of All-State running back, Justin Covington (presently a part of the backfield rotation at Villanova) have the Cardinals put their trust in a tailback the way they did with Brown a week ago. In fact, speaking of Covington, Brown’s huge evening during week #5 represented the statistically greatest performance by Cardinal Hayes player since the latter [Covington] had a 34-carry, 309-yard outing in a 2015 semifinal win over St. Anthony’s. Brown and company will look to make it two wins in a row this Friday when they face off with returning “AAA” runners-up, St. Anthony’s…After surrendering less than 100 rushing yards in any of their first three games of 2018, the Friar defense has 571 yards and six touchdowns the past two weeks. Thus, if Hayes continues to stay committed to the run, Brown could be in store for another monster showing. Note: The last time Cardinal Hayes started a season winless after two games, they went on to claim the 2016 AAA League crown. Thus, they are a team that grower stronger the deeper the season progresses. We are not sure why, but there is something about competing against Monsignor Farrell that seems to bring the best out of this 5’8, 195-pound sophomore from Yonkers. Such a natural, God-given stud, McFadden was so dominant as a freshman on the junior varsity level that the Gael coaches could not resist the temptation to promote him to the varsity for the postseason…When given this opportunity, McFadden proved to be every bit as good as advertised, running for 71 yards and a touchdown in a quarterfinal victory over this same Lion opposition. This past Saturday night, in a rumble of unbeaten programs, McFadden would again give his hosts on Amboy Road a dose of the power and acceleration that makes him one of the most heralded underclassmen in the Empire state…Taking the hand-off 17 times, the Gael 10th grader would rush for a personal best average of 8.5 per carry to finish the game with 145 yards…On top of his big yardage day, McFadden would also emerge with the first three touchdown game of his short varsity career, getting IP on the board in the first quarter (to make the score 7-6 Farrell) before later blasting his way to 15 and 23-yard TD runs (per MaxPreps) on back-to-back third quarter possessions to turn a 21-7 lead into insurmountable 35-7 advantage. 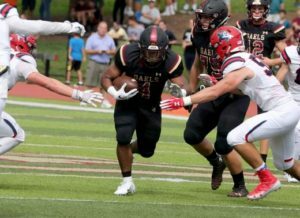 McFadden, who has now rushed for over 100 yards in three of Iona Prep’s four games this season (including a career-best 152 yards in week #1 against Bishop Hendricken) presently ranks 2nd in “AAA” with 518 yards on 79 rushing attempts. His eight touchdowns on the ground tops all Triple-A players and makes him a part of that same quartet as DeLucia for the #2 spot overall among Catholic ball carriers. Iona Prep, who at 4-0 is the last immaculate team in the 3A division, will host Christ the King during week #6 before engaging in what will likely be a battle for the top seed in the postseason on October 19th against St. Anthony’s….When he faced the Friars in the 2017 semifinals, he was held to only 25 yards on eight carries. Hence, you know he will be playing with a chip on his shoulder in two weeks.